These are the best sea salt caramels! The combination of smooth, sweet caramel and crunchy salt crystals is completely irresistible. If you've never tried putting a pinch of flaky salt on your caramels, you will be shocked at how much it changes and improves this classic candy. Sea salt has become a fashionable ingredient, and should not be hard to find in a well-stocked grocery store. I like to use a salt that has delicate, flaky grains, like fleur de sel, because those add a wonderful texture as well as flavor. If you can't find sea salt, you can substitute a sprinkling of another large-grained salt, like kosher salt. Do not substitute table salt! For the greatest chance of success, make sure you test and calibrate your candy thermometer before you begin. In a medium-large saucepan combine the corn syrup, water, and granulated sugar over medium-high heat. Stir the candy until the sugar dissolves, and periodically wipe down the sides of the pan with a pastry brush dipped in water to prevent sugar crystals from forming. Insert a candy thermometer and reduce the heat to medium. Allow the mixture to come to a boil and cook until the thermometer reads 250 F (121 C) degrees. Add the softened butter chunks and the warm milk-cream mixture. The temperature should go down about 30 degrees. Continue to cook the caramel, stirring constantly so that the bottom does not scorch. Cook it until the thermometer reads 244 F (117 C), and the caramel is a beautiful dark golden brown. Remove the pan from the heat, and immediately stir in the vanilla and 1 teaspoon of the salt. Pour the caramel into the prepared pan, and let it set at room temperature overnight to firm up and develop a smooth, silky texture. When you are ready to cut the caramel, lift the caramel from the pan using the foil as handles. Spray a large knife with nonstick cooking spray. Firmly cut into the caramels, creating 1” squares. Wipe the blade and re-spray as necessary. If you want to serve the caramels plain, sprinkle the tops with the remaining sea salt. If you're not serving them immediately, wrap them in waxed paper to help them keep their shape. If you want to cover them with chocolate, first melt the chocolate candy coating in the microwave, stirring after every 30 seconds to prevent overheating. Cover a baking sheet with waxed paper paper or parchment. Use dipping tools or a fork to dip a caramel in the melted coating, then hold it over the bowl to let the excess chocolate drip off. Scrape the bottom against the lip of the bowl, then place it on the prepared baking sheet. While the chocolate is still wet, sprinkle the top with a pinch of sea salt. Continue to dip the rest of the caramels until they're all covered with chocolate. Refrigerate the tray briefly to set the chocolate. 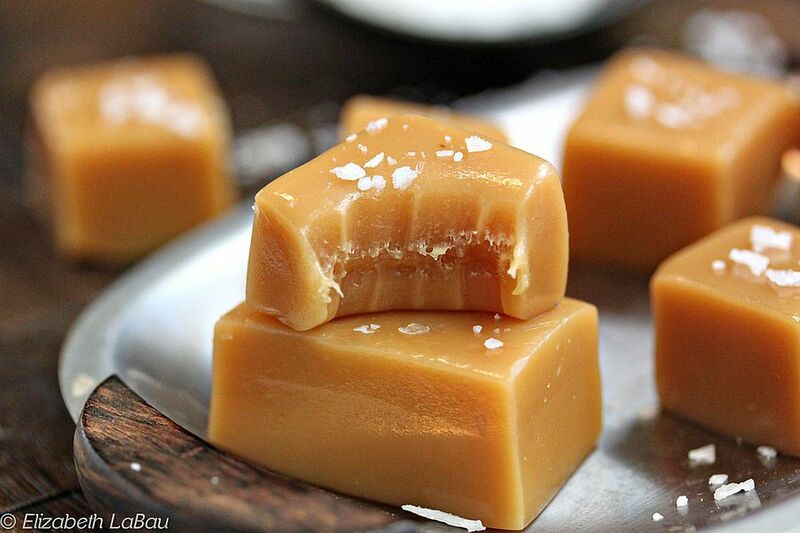 For the best taste and texture, serve these caramels at room temperature. Store them in an airtight container at room temperature for up to two weeks.